Birders in Northumberland are in a flap after two amorous ospreys returning from Africa before their other halves have enjoyed a sneaky fling. The two-timing birds are the first ospreys to be seen returning to Kielder Water & Forest Park, with the male arriving first and the female three days later. With their partners still away, they shared a romantic encounter before the male sealed their new found affection with a gift - a freshly plucked trout from Kielder Water. The rare species, which normally form faithful pairs for life, were extinct in England for 150 years but have bred successfully in the Park every season since they returned to the North East in 2009. 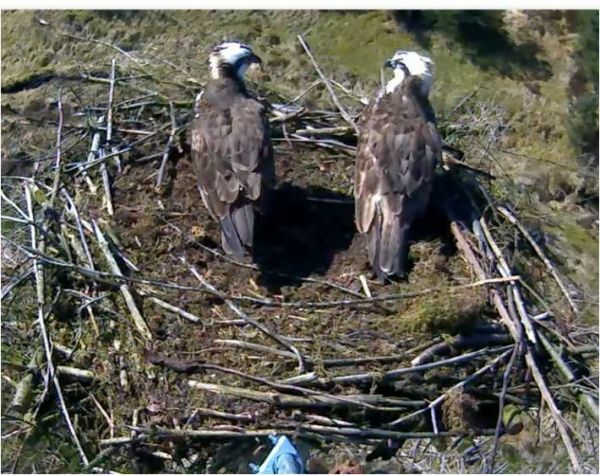 This is the first year at Kielder that an established female has returned before her male and another established male is already present without his female partner to court. While the ospreys’ fowl play might initially ruffle the feathers of their partners, it’s hoped that they too will return home safely to breed with their respective half and all will be forgotten. Joanna Dailey, Kielder Osprey expert volunteer, said: “We’re very excited by the arrival of our birds. The antics are being watched by visitors through a camera on the nest and footage is beamed to visitors at Kielder Castle. Wildlife lovers can also keep up to date with the story as it unfolds through the Kielder osprey blog at kielderospreys.wordpress.com.